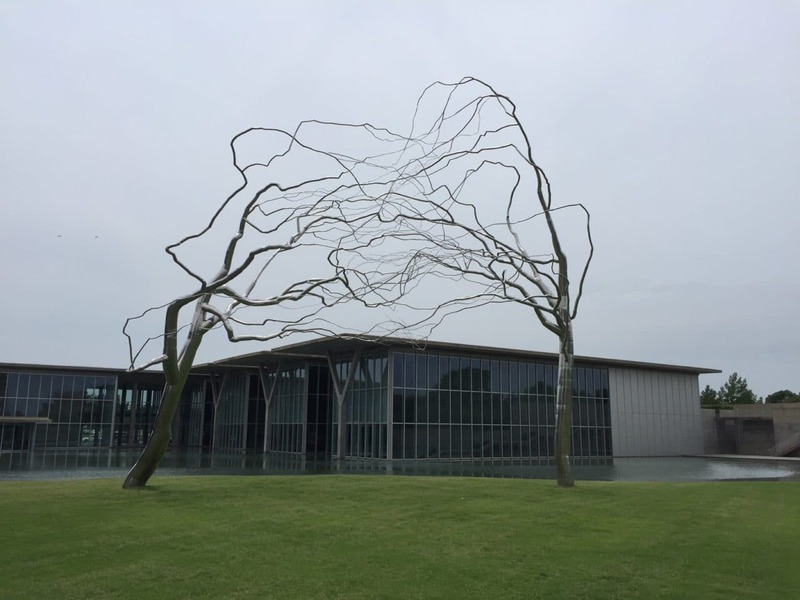 The first time I heard about the Modern Art Museum in Fort Worth was only a few months ago when my co-worker Anne told me about having her wedding there. She was surprised that I had never been, given I grew up in Dallas. I asked my mom about it and even though she still lives in Dallas and is an art lover, she had not been either. So I decided to remedy this and take my mom to visit to the Modern Art Museum to celebrate a belated Mother’s Day. The back of the Modern Art Museum of Fort Worth. 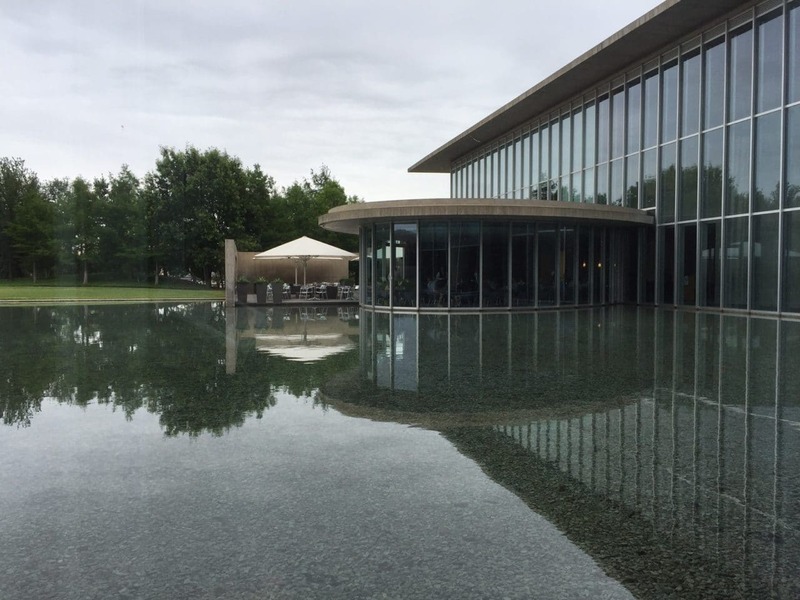 The Modern is located in a beautiful building, designed by Tadao Ando, not too far from the Kimball Museum. As soon as you enter the Museum you will immediately notice the floor to ceiling windows and the water feature in the back. Right away, I could see how it would be a perfect wedding location. The Modern Cafe, where we would be having brunch, also overlooks the water. If you plan on dining at the Cafe, I would recommend making a reservation in advance so that you can get one of the window seats. We started our visit at the special exhibit, Frank Stella: A Retrospective on the ground floor. I have to admit before my visit I was not really familiar with his work, but I was thoroughly impressed. The exhibit closes on September 18, 2016, so catch it before it is too late. 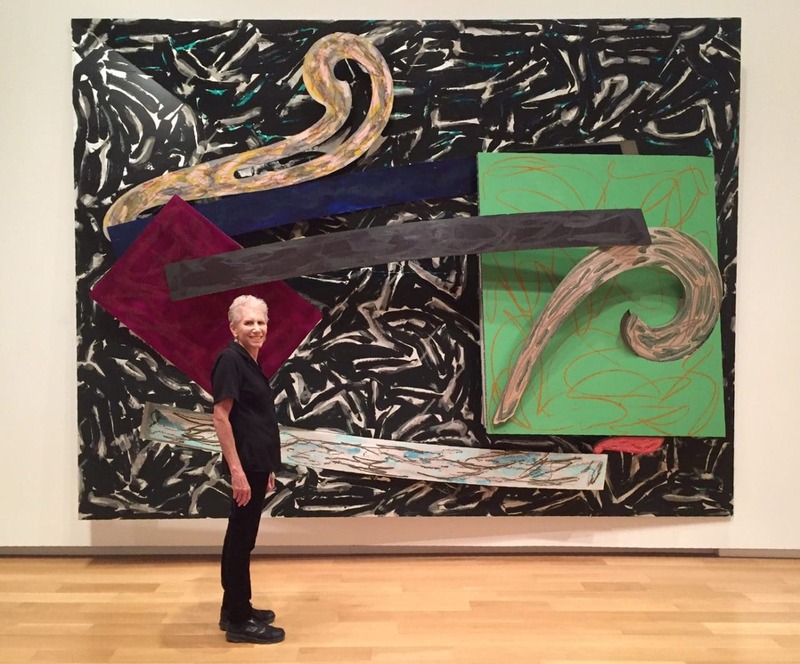 Mom in front of one of the 3D Frank Stella pieces. The exhibit starts out with some sketches that were studies for his works. It is always interesting to get that “behind the scenes” look. Next, came the paintings, which were large and very eye catching. Then, the artwork started to become more three dimensional. Stella was always willing to explore or invent new techniques to bring different kinds of space into abstraction. One of the galleries that is part of the permanent collection. Upstairs you can find the museum’s permanent collection, which definitely had some interesting pieces and some big-name artists including Andy Warhol, Banksy, Jackson Pollack, Roy Lichtenstein, and Henry Moore. As typical of any Modern Art Museum, there were a few pieces that we didn’t quite understand, but gave us a good laugh. Overall though, the artwork in the collection was really nice, so I thought I would highlight a few of the most memorable pieces. 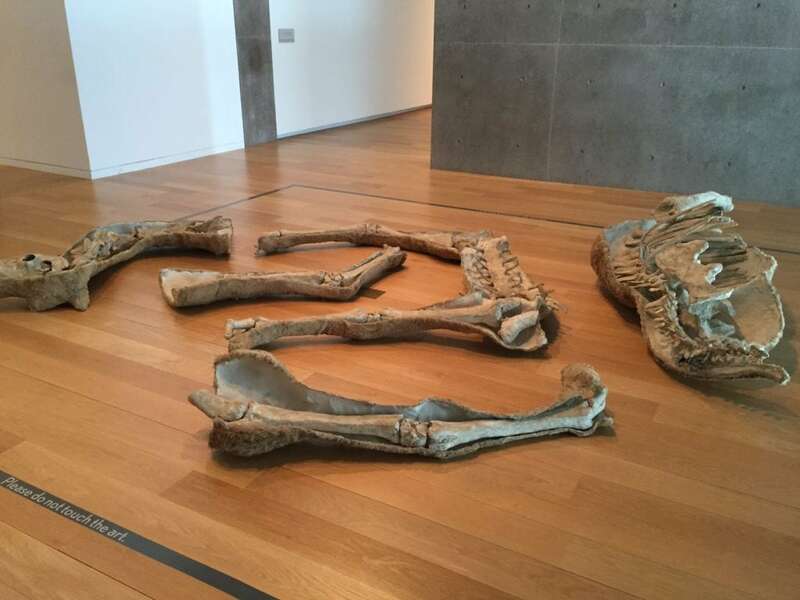 One piece that was really interesting was Inside-Outside by Nancy Graves which actually looks like animal bones on the floor. I also liked seeing sketches for Carrol Dunham’s Horse and Rider piece and the final painting. 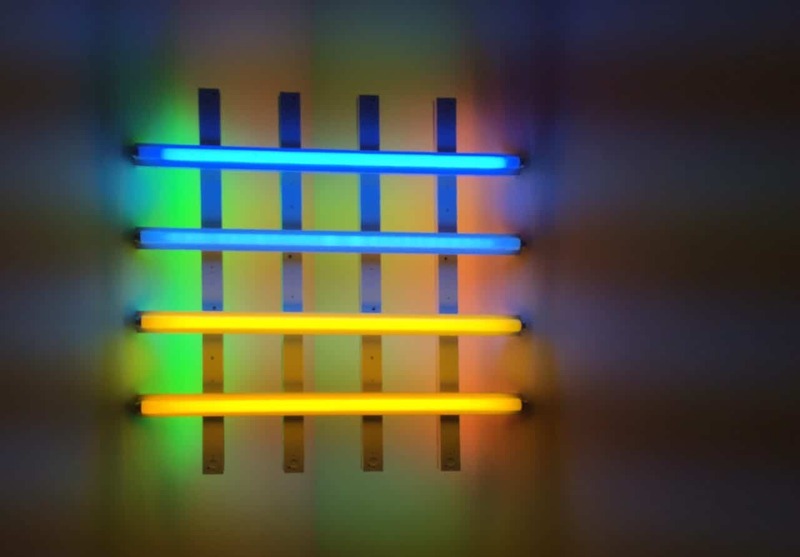 I quickly recognized an Untitled piece as the work of Dan Flavin since I had see his work at DIA Beacon. Another favorite was The Ark by Melissa Miller because I loved the colors and the way the tigers were painted. I really love this piece – The Ark by Melissa Miller. There are also some sculptures outside. I really love the Roxy Paine piece by the water. It reminded me of the piece that was part of Madison Square Park’s Public Art display in 2007. I also enjoyed the Untitled piece by Teresa Margollas that looks like benches. They are very practical since they are comfortable to lay on but they have a deeper meaning. The benches were made with water used in the washing of bodies of murdered people in the Guadalajara morgue. After we had our fill of art, it was time to take a break and enjoy brunch. The Cafe was not crowded when we got there, but unfortunately, all the window seats were taken. The food was delicious and artistically presented. To start, we shared the fried green tomatoes. They also gave us a nice bread basket that even included a raspberry scone. For my entree, I had the Modern Lyonnaise, which was similar to eggs benedict, but served on a bed of greens and asparagus instead of an English Muffin. My mom had the spring pea falafels which were also very good. I especially liked the pita bread, it tasted like it was probably fried. I also ordered one of the artful cocktails, the Mental, which was tasty but the only thing artful about it was the glass it was served in. 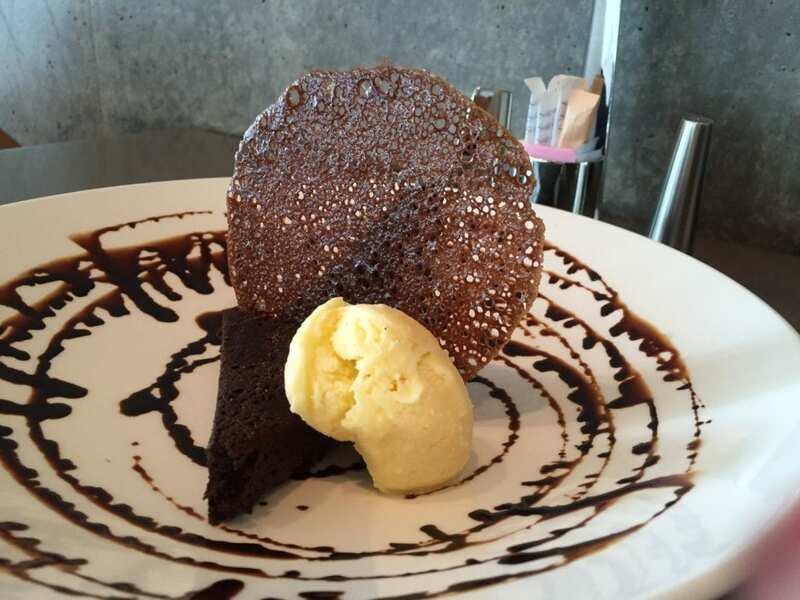 We ended our meal by sharing the chocolate tarragon brownie. My mom was a little hesitant to order it because of the tarragon and balsamic glaze, but we both really enjoyed it. The chocolate tarragon was the perfect ending to our meal at the Cafe. Before we left, we also stopped by the Museum Store. The shop had lots of great gift ideas including toys, jewelry, books, and more. Even if you don’t want to buy anything, you should check out the sketches of the plans for the building from the architect, Tadoa Ando, displayed on the wall in the front of the store. 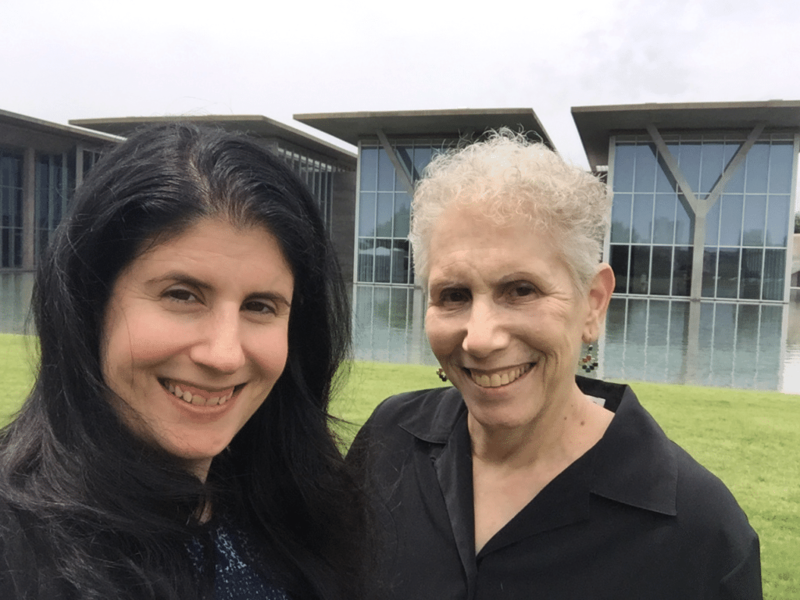 Anisa and Mom selfie in the sculpture garden of the Modern. Lastly, one thing that I did notice that I think is different from other art museums, was the friendliness of the staff. You didn’t need to approach them to ask questions, they were offering interesting stories on their own. I observed lots of friendly interactions, when normally I see the staff at museums scolding visitors about getting too close to the art or taking pictures. If you are a modern art fan, I would definitely recommend a visit to the Modern Art Museum in Fort Worth. My mother and I really enjoyed our visit. 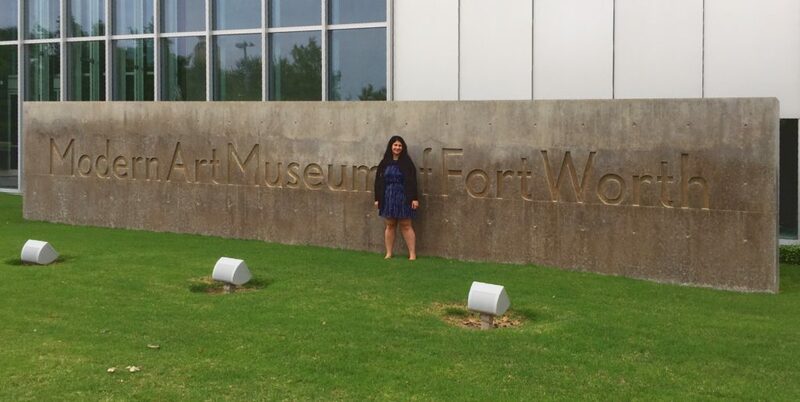 Have you been to the Modern Art Museum in Fort Worth? I would love to hear about your experience. The Modern has free admission every Sunday and half-priced on Wednesdays. Make a reservation at the Cafe in advance and request a window seat. The museum is not too big, but plan to spend 2-3 hours to see it all. The Frank Stella special exhibit closes September 18, 2016, so try to visit before then. Such a beautiful post on the museum. I will keep it in my list when I am in the vicinity. Keep up the great writing! Priyanka – Thanks so much, I hope you get the chance to visit soon! Looks like a lovely museum. Great post. Thanks Eva, hope you get the chance to visit. I’m not all that into art, but that dessert looks like this art museum is worth a visit. Heather – yes, the Cafe is worth a visit. Not only good food but a great view too. Wow that desert looks amazing! Holy YUM! Kari – yes it was good and different since it had tarragon and a balsamic glaze. Looks like a great museum to visit! Christine – Yes if you like Modern Art, you will really enjoy it. Wow this looks like an amazing art gallery inside and out! I’d love to visit it next time I’m in the area! Thanks Kaylene. It really is. Hope you get to visit soon. Angela – Thanks. Glad you enjoyed the post. Michelle yes you would love this museum! You just need to figure out how to convince your boyfriend. Maybe a bribe? Haha! Then once he goes he might end up liking it? I love the Tate Modern too. And MOMA in NYC is also great. CJ – Yes, I love the museums in London too. And agree chocolate is a good way to end any day! That pano shot is incredible! I’ve never been but I’d love to visit this museum one day. Flo – Thanks so much. I have some more pictures I will be sharing on instagram, so stay tuned. I hope you get to visit someday! Thanks Alicia. Yes, the menu at the cafe is innovative and the food we had was really good. Firstly, what a lovely ides to take your Mum for a belated mothers’ day treat. 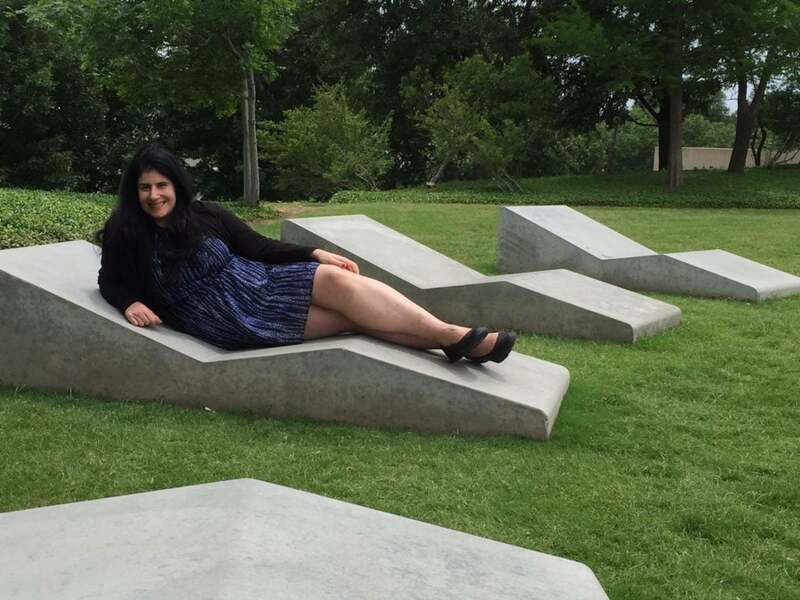 I really like the look of the large three dimensional pieces by Frank Stella and I love a good sculpture garden. Chocolate Tarragon brownie sounds amazing too. Amanda – Thank you, my mom really enjoyed it. 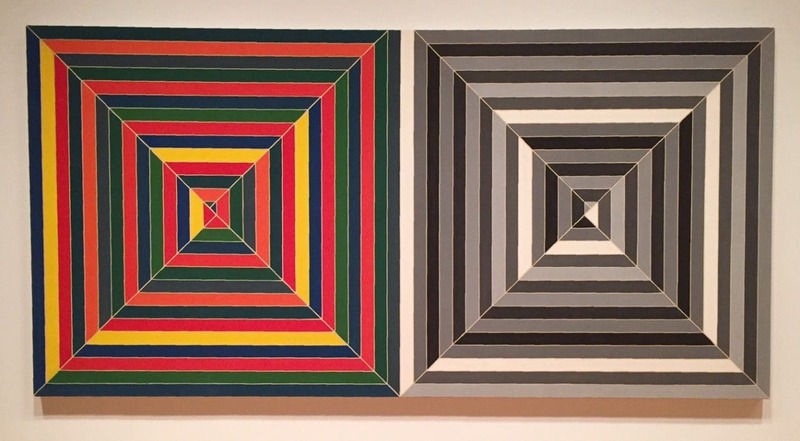 I was really impressed by the Frank Stella pieces too! I love modern art museum! I’ve heard about this one and I might need to go when I”m next in Texas! Thanks Karen. You will love it! Wow, I had no idea there was all that to do in Fort Worth. I really enjoyed my recent trip to Texas, but I only saw San Antonio and Austin. I also like Inside-Outside-very thought provoking. And the chocolate tarragon looks totally yum! Stella – Im glad you got to visit San Antonio and Austin – those are both great cities. Fort Worth really has a great cultural scene too. I hope I can visit that museum too! I find the abstract painting artsy. Yes Annika, you would love it! Thanks so much Lyn. It’s a great museum so hope you get to visit! The one thing I always love about art museums is how intriguing and inspiring they are on the outside and inside. This one is no exception. I’m always curious about modern art, and these displays are truly unique and fascinating. Brooke – I definitely agree with you on that. I also really enjoyed the Guggenhiem in Bilboa – another museum that is inspiring both inside and out. I was lucky enough to see the Frank Stella exhibit too, the museum did a fantastic job walking you through Stella’s progression as an artist. I think a fair number of pieces came from The Menil in Houston, so after Sept 18th, they may return there. This area is referred to as the Museum District, the Kimball is there as well, and has world class art. The botanical gardens are nearby – don’t miss the Rose and the Japanese gardens! Kathleen – Thanks. Yes the Kimball is a great museum too. I will have to check out the botanical gardens at some point.